The Share Account is the core of your membership and entitles you to all of our valuable member benefits. By opening this account, you become a Financial Trust FCU owner, as well as a member, with a voice in how the credit union is operated. There is no better way to save than by Payroll Savings. Financial Trust FCU’s payroll savings card will tell your employer to send “x” amount of dollars directly to your credit union from your paycheck. 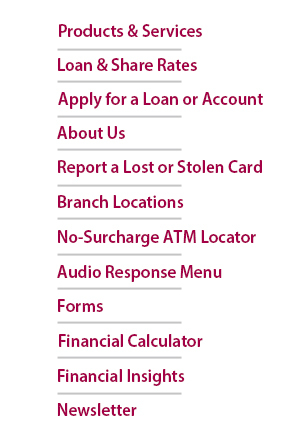 Financial Trust FCU has three Checking Accounts available to our members. Count on your payroll, Social Security and other government checks to be there when you need it. No standing in lines by having your checks automatically deposited into your checking account with Financial Trust FCU. Direct Deposit saves you the time and trouble of making your deposits in person, to make your schedule a little less hectic sign up for direct deposit today. Direct Deposit makes it easy to build your savings on a regular basis to meet important goals. Simply arrange to have a portion of your deposit made into your Savings, Money Market, Club accounts. Your savings will grow with regular deposits and you’ll have the money you need, when you need it. Financial Trust FCU has two Money Market Accounts available to our members. Unlike other savings accounts, your Term Share lets you lock in a rate for the entire term. Your dividends are credited quarterly. Terms range from 6 months to 3 years with minimum balance requirements from $500.00. Prepare for a Secure Future with an Individual Retirement Account or Educational IRA’s for college expense. Open a club account to build your holiday spending money. By making deposits on a regular basis throughout the year, you’ll have the money you need, right when you want it. On November 1st of each year we transfer your funds directly to your checking account. As little as $20.00 a week gives you $1,040 plus interest for all your shopping needs. Never seem to have the funds to go on a vacation? Take advantage of our Vacation Club by making deposits on a regular basis, earn dividends and take the trip of your dreams. Teach your child the valuable habit of saving money. Financial Trust FCU Scottie Club makes this habit fun and enjoyable for you and your kids. By starting early, they’ll get used to saving money on a regular basis and the rewards of earning dividends on their funds. Your child can open a Scotties Club account with as little as $25.00 and begin earning dividends immediately. We’ll even send a quarterly statement to help keep track of your child’s progress and give your child the satisfaction of watching that money grow. As your child saves, he or she can also earn premium Scottie items, depending on the savings balance at the end of each quarter. To receive a complete disclosure of all the terms and conditions of our products and services ask a member service representative for a Membership Booklet. When you need affordable credit, you can count on Financial Trust FCU for low interest rates, flexible terms and payments that fit easily into your budget. Whether you want to save by consolidating your high-cost bills into one low monthly payment…pay for special events like a child’s wedding or a one-in-a-lifetime vacation. When you need affordable credit, you can count on Financial Trust FCU for low interest rates, flexible terms and payments that fit easily into your budget. This credit card is a Fixed rate credit card! with no balance transfer or annual fee! Take advantage of the equity in your home. Financial Trust FCU has three Home Equity loans from variable rates to fixed rates with lines of credit options. We’ll take you from application to commitment. Plus, there’s No Closing Cost. Apply today and choose the term that best fits your personal needs. At Financial Trust FCU, we take great pride in making home buying easier and more affordable for our members. With some of the best rates available and variety of packages tailored to meet your needs, we can help open the door to the house of your dreams. You can choose a fixed rate or variable rate mortgage with terms of 10, 15, 20, 30 years, whatever best meets your individual financial needs. We all deserve a little fun in our life and what better way than with a boat, motorcycle, camper. At Financial Trust FCU you can count on low interest rates, flexible terms and payments that fit your budget. Stop in to day and have fun tomorrow. Your schedule is hectic, and we realize you can’t always get to the credit union. That’s why we give our members access to convenient “self-serve” alternatives. You can use your card at any ATM that’s part of the VISA network. Any time day or night, you can use your card to; make withdrawals from your savings or checking, transfer funds from savings to checking, check your account balances to make it easier to reconcile your account. It looks like a credit card but works like a check. Now you can make purchases directly from your checking account with the convenience of a card – Financial Trust FCU VISA Check Card. You can also use your VISA Check Card wherever you see the VISA log to get cash at an ATM machine, transfer funds from savings to checking or to pay for your gas, buy groceries, or purchase any item. At Financial Trust FCU, we understand that you need financial services to keep pace with your busy schedule. That’s why we offer the Telephone Response System. You can access your accounts from the comfort of your home, or anywhere it’s convenient for you. Why make a trip to the credit union when you can make a phone call? You will save time with one quick call to (716) 831-0695. Financial Trust FCU on-line home banking is fast, easy and free! You can log on to your accounts from your home, the office or anywhere there’s an Internet connection! Just go to www.FinancialTrustFederalCreditUnion.com, click on HOME BANKING, and then enter your account number and password. For added security, you will need to contact member service to be assigned access. You can perform withdrawals, transfers, make loan payments, obtain balances information on your share, checking, club and loan accounts. RDC is designed to allow you to make deposits of checks ("original checks") to your checking or savings account from home or other remote locations by photographing the original checks and delivering the digital images and associated deposit information ("images") to us or our processor with your mobile device. Once you are signed up for Financial Trust FCU's online and mobile banking, you may apply for RDC. If you are currently enrolled with FTFCU's online and mobile banking, visit our "Forms" page for an RDC application. Safe Deposit Boxes are available in a limited number at our Orchard Park location (6520 Webster Road, Orchard Park, NY 14127). See below for box sizes and annual fees. For more information, please stop in or call any FTFCU location. ©2013 Financial Trust Federal Credit Union. All Rights Reserved.